If you know me from my blog or column writing I think you'll like the snark and self-deprecation of the main character. Her name is Marzie Nowak. And she's been around the block, raised a few kids, and knows a few things. Except, what's really going on in her hometown of Widow's Bay. If you're here because you love paranormal cozy mystery novels than you're in exactly the right place. Resting Witch Face is sort of like if Twilight, Desperate Housewives, and Stephanie Plum were stirred up in a cauldron by Samantha from Bewitched! Readers of awesome authors like Kristin Painter, Amanda M. Lee, Adele Abbott should feel right at home in Widow's Bay. Also at home in Widow's Bay are the Yooper Naturals. I can't wait for you to meet them! The book is set in Michigan but a Michigan you might not know – the Upper Peninsula. Yep. WAY up there. Where things are just a touch magical, a little mysterious, and a lot cold unless it's August of course. If you've watched and read my work or shared a laugh with me on tv or social media over the years I just want to thank you so much. Your support gave me the encouragement and confidence to start this new adventure as a fiction author. If you're new here, welcome! We're going to have some fun! 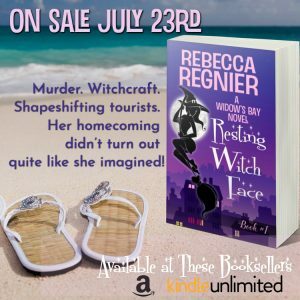 In the next few weeks leading up the release of Resting Witch Face I'll be blogging about the book, doing some Facebook lives, and generally sharing my excitement. On July 23rd my book will be released into the wild. I may ask you to hold my hand that day! And thank you. Your support is EVERYTHING! As my old television theme song said, I'm SO GLAD YOU'RE HERE!